Construction has started on the first new building in 50 years in Vancouver’s Railtown district, a tract of Downtown Eastside which will see a surge in development after the city enacted more flexible zoning for the former manufacturing hub. 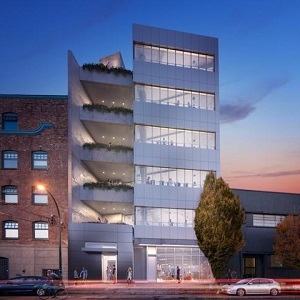 This month, Rendition Developments broke ground on Bench, a six-storey, 35,000-square-foot office and light manufacturing building at 353 Railway Street. It’s the first of several similar projects planned for the historic district set next to rail lines between Gore and Heatley Avenues. In May 2017, Vancouver updated zoning permissions for Railtown. The changes ended permission for heavier M-2 industries in the 16-acre zone and introduced more flexible I-4 zoning, which allows a blend of light industrial and creative design uses with office. Local developers and brokers consider the changes a relief which will help to usher in a more modern, digitally driven manufacturing industry in the gentrifying area. Railtown already hosts several design firms, showrooms, studios and light manufacturing including companies such as Tritex Fabrics, Aritzia and Herschel Supply Co.
“We broke ground last week,” said Brian Roche, the president of Rendition Developments, which expects to complete Bench in early 2020. Roche said the new zoning allows tenants to make products both physically and digitally. “Now you can manufacture on a digital platform and the city is now recognizing that as a form of manufacturing in Railtown,” he said. Roche said Rendition is still deciding whether Bench will be sold as strata units or leased. The building will accommodate a mix of occupiers. He said the building could accommodate approximately seven companies. A recent report from Cushman and Wakefield estimates there could be as many as 11 development projects in the area, adding 832,000 square feet of new workspace. Among the next ones is the Maker Exchange. It’s a planned seven-storey, 152,000-square-foot building being co-developed by Omicron and Rendition, which would eventually add up to 1,500 new workers at 488 Railway Street. One block over, the owner of Inform Interiors, Niels Bendtsen, plans to build a six-storey, 112,000-square-foot building with office and industrial uses to replace two existing commercial buildings. The projects will help companies expand and remain in Railtown, said Justin Omichinski, a principal with Avison Young, the listing agency for Bench. “It’s really a tight market in Railtown,” he said. “There’s really no vacancy. (Bench) is the first development in 50 years. About 90 tenants now work in leased spaces at 33 commercial buildings in the area, according to the Cushman and Wakefield report. About 24 per cent are in clothing, furniture and design firms. Another 10 per cent are consultants and nine per cent work in digital media. Additional similar businesses will be starting and staying in Railtown, Roche said. He said the building boom will allow burgeoning companies to put down roots when they surpass the start-up stage.